Assistive Technology finds solutions to enable individuals to adapt to their environment with a wide range of options. ADAPT Community Network provides evaluation, selection, instruction, and introduction customized to each individual’s needs. Our Assistive Technology includes vision, hearing, communication, daily living, and environmental control modifications. 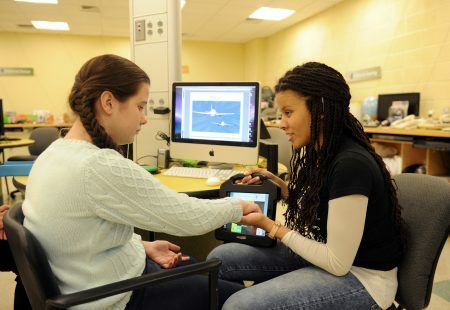 Our ADAPT TechWorks Centers, located in Brooklyn and Manhattan, specialize in Assistive Technology devices and services to help people maintain and increase their independence. 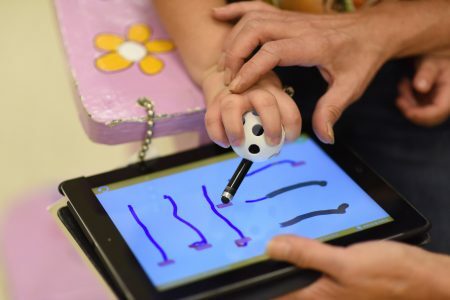 Since 1990, ADAPT Community Network, formerly United Cerebral Palsy of New York City, was chosen by the New York State Assistive Technology Act Program (TRAID) as the New York City regional center for technology. We provide free assistance for all New York City children and adults; educating and acquiring Assistive Technology for them, allowing more independence in the home, school, workplace and community. Our TechWorks Centers provide visitors an opportunity to test and borrow an array of products designed to assist and support individuals with disabilities. TechWorks offers hands-on use of adapted toys and switches, adapted computers and peripherals, wheelchairs and inserts, augmentative communication systems, daily living devices, home and workplace modifications, environmental control units, adapted telephones and much more. Demonstrations: Have a specific item in mind? You can try any device in our extensive inventory with someone skilled in its use. 60-day Loans: Some, but not all, of our devices can also be borrowed for a limited time. Loans are also available for repair or to accommodate short term needs like recovery from surgery. Training: We do extensive trainings on a wide range of topics for individuals and groups. Public Awareness: If you serve a group that needs to know more about Assistive Technology and the State Assistive Technology Program, we can present at your conference or resource fair. TechWorks To Go! : Our fully stocked TechWorks To Go! 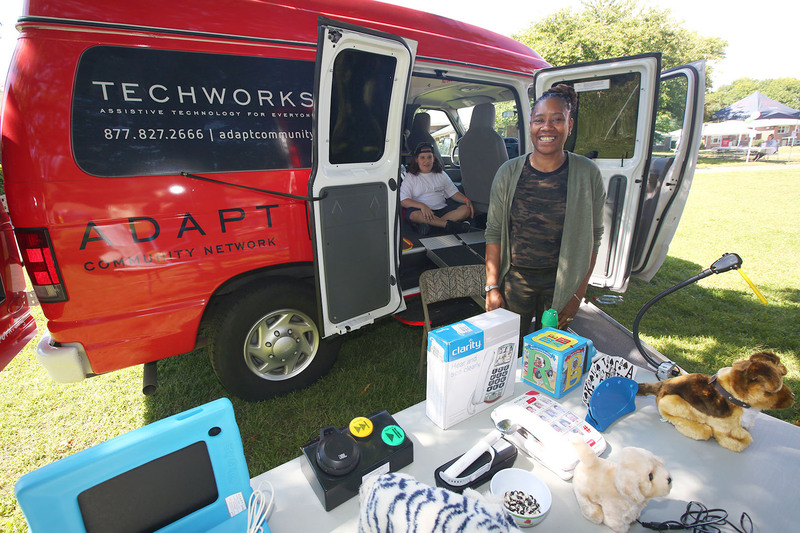 van brings Assistive Technology to group events in the community. We can come to health and resource fairs, nursing homes, senior day centers, libraries, schools and workplaces. ADAPT’s Samuel Hausman Activities, Resources & Education (SHARE) Centers are a free, public resource for families and professionals who work with children with disabilities. Located at our campuses in Brooklyn, Staten Island, Manhattan and the Bronx, our skilled SHARE librarians support the community through loans of specialized resources. Families have access to a wide variety of informative books, articles, and audio-visual materials regarding child development. Adapted toys and switches are also available for loan. Play is critical for every child’s socialization and development. We showcase a wide range of toys and other play items adapted for easy use. Families will find puzzles with handles, battery operated toys with switches, sensory stimulation toys, and much more. Offers unique learning opportunities for children with developmental delays or disabilities. On-site computers with adapted keyboards and specialized software allow families to experiment with the most effective tools for their child. For children and adolescents with delayed or impaired speech, a variety of augmentative communication systems are available for demonstration. These range from simple communication boards and battery operated devices to more sophisticated electronic devices with voice output. Referrals can be made for formal evaluation at our GHI Augmentative Communication Center. For children who lack the fine motor skills to manipulate standard on/off buttons, switches facilitate access to computers, lights, radios, battery-operated toys and small appliances. Technology specialists are available for group presentations and technology demonstrations throughout NYC. Arrange a presentation for your parent, professional or school group and learn how adapted toys, switches and other forms of assistive technology make a profound difference in the lives of children with special needs by helping them to grow, learn, play and socialize.